China's Li Na knocked out fourth seed Agnieszka Radwanska in straight sets to reach the semi-finals of the Australian Open. Maria Sharapova faces her fellow Russian Ekaterina Makarova in the second women's quarter-final of the day, after David Ferrer takes on his Spanish compatriot Nicolas Almagro. Defending men's champion Novak Djokovic meets Tomas Berdych in the night session at Melbourne Park. The Serb will be hoping to have recovered all his powers after a five-hour epic against Stanislas Wawrinka in the previous round. Li ended fourth seed Radwanska's 13-match winning streak to the start of the year with a straight-sets victory that put her into the semi-finals. In a match featuring 10 breaks of serve, the sixth seed won an unpredictable first set lasting 66 minutes and claimed five games in a row from 0-2 down to take charge of the second. The Chinese player broke Radwanska's service in the sixth game of the second set without losing a point and fended off two break points when serving for the match to prevail in one hour and 42 minutes. The world number six, formerly coached by her husband Jiang Shan, praised the input of her new coach Carlos Rodriguez. "I think it was pretty good for me and my husband. It is much easier for our life. We don't have to shout at each other on the court and also off the court," she joked. 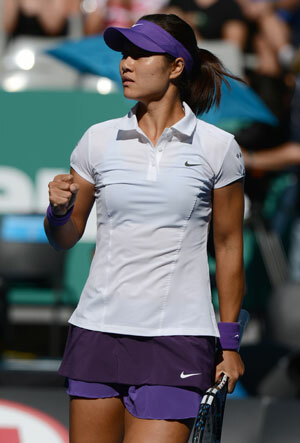 Li, who lost the 2011 final to Kim Clijsters, will face either Maria Sharapova or Ekaterina Makarova in the last four.